Joy is a real Joy. 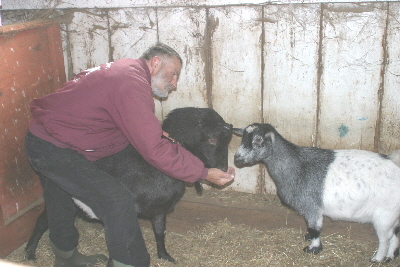 Joy is a pigmy goat that came to us in the summer of 2007 from the Western part of Michigan stemming from a change in living arrangements. Joy lives with Jet, a crippled LaMancha goat that we rescued several years ago. Jet, the all black goat, lives in a special place in our barn for his protection. With Joy, Jet has a constant companion to keep him company. Jet says “thank you” for your financial support through our soap sales for being able for Joy to come to our farm to keep him company.